Violin Concerto No. 5 in A Major, K. 219 "Turkish"
[Mozart 5]: Delight in the composer's invention starts the moment Hahn's violin makes its debut flying in the sky like a lark. Her nimble charms continue in the graceful adagio -- music that always seems about to curtsey -- and the mischievous rondo finale. So, a jewel of a concerto; bejewelled playing too . . . [Vieuxtemps 4]: [Hahn is] playing with [passion and dramatic instinct] . . .
. . . she brings both grace and immense force to these performances with conductor Paavo Järvi and the Deutsche Kammerphilharmonie Bremen. There's no better example than the final movement of the Mozart, a rondo that is by turns regal and rollicking. Hahn never gives up her pinpoint precision in the movement's minuet theme. And she brings out real muscle when, in the middle of the movement, Mozart inserts a janissary-influenced section that evokes a Turkish military band and gives the concerto its nickname. The whole album is a pleasure . . .
. . . Hahn takes a Romantic view of Mozart, with bold gestures, a wide dynamic range, and fruity vibrato . . . [the last movement] finds her at her best . . . [Hahn is naturally] attuned to the Vieuxtemps, where she can pull out the emotional stops, especially in the slow movement and the cadenzas. Paavo Järvi and the Deutsche Kammerphilharmonie provide wonderful accompaniments for Hilary Hahn -- always finely balanced and expressive, and, in the Vieuxtemps, providing the necessary elements of drama and emotional colour . . . Her Mozart is elegant, stylish and played throughout with beautiful tone . . . [the Vieuxtemps] is remarkable, with Hahn playing the role of melodramatic protagonist to perfection; she has a powerful presence and, in the finale, finds a truly heroic tone . . . the performance as a whole, bold in its freedom and air of conviction, would surely have delighted its composer.
. . . [a superb album from] the brilliant Hilary Hahn . . . the Vieuxtemps is really a natural fit, showing off her extraordinary technique. She brings the same rich sensibility to the Mozart, which [is impressively sparky] . . . Paavo Järvi and the Deutsche Kammerphilharmonie Bremen provide appropriately expressive support.
. . . [Hahn] is a persuasive champion of Vieuxtemps's Concerto No 4 . . . her flair for tempering soaring passion with intelligent restraint makes the work's heady romanticism easily digestible. It is coupled with Mozart's A major concerto, to which Hahn brings a distinctive spark. Her first entry pours balm over the crisply agitated orchestral opening; the slow movement is muscular and lyrical; the finale, in which the pseudo-Turkish episodes are played up exuberantly, has real party spirit. Under Paavo Järvi, the Deutsche Kammerphilharmonie Bremen is excellent in support. The wonderful Hilary Hahn has a new CD . . . her familiarity with and deep understanding of these works is evident throughout the CD, the Mozart in particular benefitting from her usual crystal-clear tone and her immaculate and intelligent phrasing . . . [Vieuxtemps]: it's a fine concerto, with a particularly effective slow movement, and it's difficult to imagine it receiving a better performance. Hahn is accompanied by the Deutsche Kammerphilharmonie Bremen under Paavo Järvi, whom she describes as "musical partners for a long time". It certainly shows in these terrific performances.
. . . brilliant performances . . . Meticulously and poetically partnered by the Deutsche Kammerphilharmonie of Bremen, conducted by Paavo Järvi, Hahn clearly has both concertos in her DNA -- each sounds comprehensively planned out at 30,000 feet, yet totally natural and organic. Hahn's way with Mozart's "Turkish Concerto" transcends stylistic and historical considerations in a communion between Hahn and the composer with the violin her means of expression. Her attacks throughout are breathlessly timed, she gives the slow movement a simplicity and breadth that allows Mozart's songs and reflections to speak gloriously from the heart -- she exults in the exotic implications of the last movement; and Joachim's first movement cadenza has never sounded more appropriate. There are similarly illuminating touches throughout the Vieuxtemps: In the Adagio religioso, Hahn ramps up the intensity through a gripping crescendo to a rapt, pristine state that for once sounds convincingly spiritual. In the Scherzo's iconic trio, Hahn is simply, sublimely in tune and drop-dead gorgeous in sound. Extremely fine performances from Hilary Hahn and the Deutsche Kammerphilharmonie, Bremen under Paavo Järvi of concertos by Mozart and Vieuxtemps combined with a first rate recording make a new release from Deutsche Grammophon a real winner . . . The Deutsche Kammerphilharmonie, Bremen give a light and lithe sound to the "Allegro aperto" of Mozart's Violin Concerto No.5 in A major, K.219 with lovely alert playing. Hilary Hahn enters with a lovely pure tone, slowly drawing Mozart's fine melody before suddenly taking off in the "Allegro" proper, bringing an equally agile, lithe touch. Järvi and his players allow some distinctive orchestral textures to appear whilst Hahn's wonderful tone produces some glowing colours and textures. Her superb technique shows up particularly in the cadenza (by Joseph Joachim) but she is not merely virtuosic, drawing such fine textures all with a fine sensitivity . . . If anyone can reveal the qualities of Vieuxtemps' Violin Concerto No.4 in Da minor, Op.31 then it is surely Hilary Hahn and the fine Bremen players under Järvi. Järvi and the Deutsche Kammerphilharmonie, Bremen open with an absolutely lovely "Andante -- Moderato", drawing beautiful playing, so fine textured, allowing woodwind and other instrumental layers to be revealed. The recording adds so much to the detail of orchestral sound. When Hilary Hahn enters she brings an exquisite tone in her hushed entry before rising to some very fine incisive, fiery playing, producing some fine timbres. She follows Vieuxtemps' every change of mood and provides some terrific runs on the violin before a very fine cadenza.
. . . [a] sumptuous string tone, impeccable intonation and the ability to render interpretive details with almost offhand grace. Paavo Järvi and the Deutsche Kammerphilharmonie Bremen make capable partners . . . you can hear in these performances evidence of an engagement that took root early and has only blossomed over time. Paavo Järvi and Deutsche Kammerphilharmonie Bremen offer liveliness and precision to pave the way for Hilary Hahn . . . she is given a natural and integrated balance with the orchestra: first among equals. Her playing is superb, full of incident and interest, vigorous and varied (in tone and dynamics) and the whole is enjoyable and enlightening . . . [Hahn's playing of Joseph Joachim's cadenzas] is charismatic. The Adagio flows persuasively while retaining its pathos, and at the mid-point really moves the soul . . . The finale, ostensibly elegant, and nicely lilting here, gives way to the "Turkish" episode, full of virility, surges and percussive bow-taps . . . [the D-minor Violin Concerto by Henri Vieuxtemps is] beautifully played by all concerned. The Scherzo scurries delightfully, and the finale (returning to the Concerto's very opening) then enjoys martial pomp, with pealing figures in the strings, and fiddle fireworks to end . . . if anyone can "sell" it, then Hilary Hahn is just the violinist to do so. The Vieuxtemps Concerto is beautifully poised, rich and vibrant; the scherzo brings out the best in Hahn's wonderfully accurate technique, allied to a real sense of fun, while the outer movements have warmth and charm . . . this is an emotive disc, played with fire and commitment, and recorded to the standard one would expect of DG. Recommended. Paavo Järvi and the Deutsche Philharmonie Bremen play the opening tutti of Mozart's Fifth Concerto with a pointed articulation that provides an exceptional contrast to Hahn's flowing lyricism . . . In the movement proper, she plays with a brash energy and a correspondingly ruddy tone that roughens the edges of themes . . . She introduces subtleties into a movement that has become a path well-trodden . . . the overall effect seems to be a sort of raw vigor and energy . . . Hahn takes the time to play it expressively as well as commandingly -- perhaps the only approach possible that will transmute its many technical passages into listenable gold. In the slow movement, Hahn and the orchestra indulge in an exceptional series of interchanges . . . And just as she made sense of the first movement's cadenza, she does so again in that of the second movement. All this intelligence and energy bode well for the finale, and her highly personal performance of it isn't disappointing . . . [Vieutemps 4]: she plays with magisterial authority and the required bigness . . . Yet she allows Järvi to make of the expansive symphonic writing more than a mere accompaniment . . . If any single modern recording of an old virtuoso work reinvigorates the tradition of the golden age, this one does . . . In all, then, very strongly -- even urgently -- recommended. The Vieuxtemps Concerto is beautifully poised, rich and vibrant; the scherzo brings out the best in Hahn's wonderfully accurate technique, allied to a real sense of fun, while the outer movements have warmth and charm . . . [Mozart 5]: the Allegro aperto is lively and the finale is fun . . . this is an emotive disc, played with fire and commitment, and recorded to the standard one would expect of DG. Recommended. Exotisch feurig . . . Die Deutsche Kammerphilharmonie und Paavo Järvi erweisen sich als ebenso sprühend lebendig wie rücksichtsvoll agierende Partner. Federnd wie eine Opernouvertüre schwingt sich der Beginn von Mozarts A-Dur-Konzert empor, ehe die Streicher die Solo-Kantilene in Begleitfiguren betten. Quasi aus dem Orchester heraus gestaltet Hahn das kunstvoll variierte und (besonders im Moll-Teil) wunderbar innige Adagio . . . Ihr Talent für Fokussierung und Stringenz spielt Hahn beim Vieuxtemps-Konzert in großen Bögen aus. Hörenswert, wenn im "Adagio religioso" der an Dvorák erinnernde Bläserklang auf die brillante, gesangliche Solopartie stößt. Aber auch das Scherzo à la Paganini und das fingerbrechend schwere Finale gelingen der Solistin und dem Orchester bravourös. Diese Aufnahme besticht durch ihre feinnervigen poetischen Ausformulierungen auf der Basis eines blind vertrauenden Einvernehmens zwischen Hahn und den Musikern der deutschen Kammerphilharmonie Bremen. [Mozart 5]: Paavo Järvi, seine Bremer Kammerphilharmonie und die virtuose Solistin präsentieren es hinreißend festlich-diesseitig . . . [Vieuxtemps 4]: auch diese Darbietung ist vom Feinsten . . .
. . . [ein flammendes] Plädoyer für das formal ebenso originelle wie überzeugende vierte Violinkonzert. 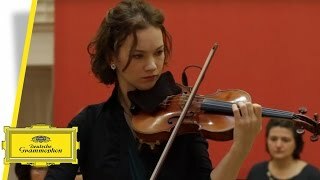 Hilary Hahn stürzt sich mit der ihr eigenen technischen Meisterschaft und einer gehörigen Portion Herzblut hinein, die Kammerphilharmonie Bremen gestaltet ungemein sorgfältig und kammermusikalisch pointiert mit. Gewohnt perfekt zieht Hilary Hahn melodische Linien, glasklar, schnörkellos, hoch konzentriert. Sie hat in jedem Takt die totale Kontrolle über das Instrument und ihre Emotionen . . . Fans, die die Schönklangästhetik von Hilary Hahn mögen, werden diese Interpretationen schätzen. . . . Die Deutsche Kammerphilharmonie Bremen gestaltet unter der Leitung von Paavo Järvi wie immer hoch differenziert und aufmerksam.
. . . [Mozart]: von unfehlbarer Perfektion . . . Hahns Vuillaume-Geige funkelt; zu jeder Zeit hört man ihren kraftvollen Zugriff . . . [die Kadenzen sind] solistisch brillant . . .
Hilary Hahn findet für beide Werke den richtigen Ton und besticht durch ihr gewohnt stilsicheres, glasklares und zugleich hochemotionales Spiel. Stets an ihrer Seite: die Deutsche Kammerphilharmonie Bremen, die sich unter der Leitung von Paavo Järvi als idealer musikalischer Partner erweist.